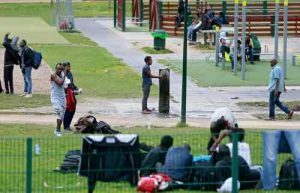 ER Editor: Also see this Daily Mail article from August 2017, African migrants intent on reaching Britain return to Brussels park where they drink and wash from fountain water, reporting that the migrants living in the Park are generally seeking to get to the UK. Employees of the Belgian government have been told to avoid a Brussels park heavily populated with migrants after a slew of robberies and attacks in recent weeks, according to local media. BRUSSELS – At least seven government officials have been ambushed since the beginning of last month, as they were passing through Maximilian Park, De Standaard reported. Government employees union ACOD warned members to rather take a bus or a taxi, noting that previous warnings about the increasing danger that migrants pose had been ridiculed. According to SCEPTR, civil servants were advised, “given the current social context and the dark days,” it would be “best for their safety to avoid the Maximilian Park and to focus on well-lit main roads”.